in the US and more than half a million people were injured in police-reported crashes during which some form of driver distraction was reported — and according to the National Highway Traffic Safety Administration, cell phone use was a major contributor to that. To help combat distracted driving, Google Maps has worked with The Oprah Winfrey Show to power the mapping for Oprah’s No Phone Zone initiative. The simple pledge form gives you three choices for more responsible driving: no texting, no texting plus handsfree calling only, and no phone use at all while driving. The first of two maps we’ve made shows where across the US and Canada people have electronically signed the No Phone Zone pledge. It’s nearly real-time, so as you watch the maps you can see the latest name, city, and state/province to join the hundreds of thousands of commitments. This is a nice use of our Google Maps API to allow folks from around the country to easily share their voices on a map in near real-time. Check it out! The second map helps you educate yourself about state policymaking. 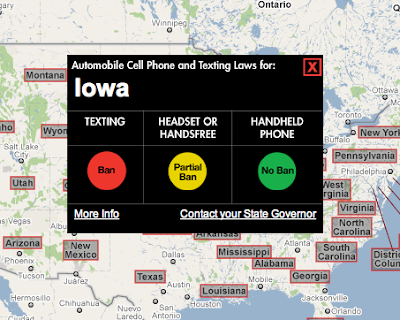 Click on a state to restrictions on texting, handsfree, and handheld phone use, and then click through for more details from the Governors Highway Safety Association or to contact a state’s governor directly. I’ve already signed the pledge but I plan on keeping an eye on the map to watch as more submissions come and see how others make use of it. To learn more about what our mobile team is doing to support safe driving practices, visit our Official Mobile Blog. Mobile communication has revolutionized the way we live, but unfortunately, irresponsible use has also made the roads more dangerous. In 2008, nearly 6000 people lost their lives in the US and more than half a million people were injured in police-reported crashes during which some form of driver distraction was reported — and according to the National Highway Traffic Safety Administration, cell phone use was a major contributor to that.